I just received a special letter (sent over by LBC) over the weekend. When I opened it and read it, I thought it was a bogus letter! Another one of those misleading letters! So - the 'complainant' in me decided to give DTI a call to inquire and report on the fraudulent-ness of the letter. I first called Globe Telecom to inquire - and as expected, I was told that the letter and the promo was indeed fraudulent. I then called DTI and was told by the operator, that the DTI Permit number was not found. This made me more curious! I was then passed to the Promos department, my call was answered by a certain Rose , without asking the nature of the letter - she immediately told me 'Basta kapag may letter, VALID na po yan' How the hell did she know?! She didn't even ask me for the DTI Permit number! So I insisted - amazingly - it was VALID! She then sounded eager to put the phone down - but I still questions. She was really reluctant to answer them. Luckily - I got her name! 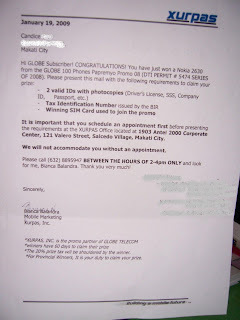 She told me a few details like the promo was from a Globe prepaid promo and adviced me to call the number on the letter. I finally got to talk to Bianca (the undersigned) and she informed me that INDEED, I won a Nokia 2630!! :) Cool right? It gets better! Since I am one of the winners - I have an option to win myself 100 units of Nokia 2630 - but the raffle will be done using a tambiolo with 10,000 balls - out of the 10,000 balls, there is only ONE ball that says that I've won 100 units of Nokia 2630. The other was called a consolation prize, meaning - I won't need to pick a ball from the tambiolo - by waiving the right to join the 'tambiolo' contest, they will be giving me another Nokia 2630 phone! So all in all, I will be bagging 2 units of Nokia 2630!! Yehaaaaaa!!! But now, I'm back!! And why? Because of American Idol baby!! :) Yeah!! Yes, one of the shows I enjoy immensely! 1) During the last week of every month - I am sure to scout for next month's copy of OK! Philippines. Last December, well - it totally slipped my mind! It was only when Fran asked me if I had a copy, did I remember! I never missed a copy - ever!! (Promise!) 2) I've only been to Starbucks, TWICE ! Can you believe it? My gosh.... 3) I haven't been to Trinoma in 3 weeks! I'm usually there once or twice a week! 4) I totally forgot to ask for MMFF passes!! Yes, I am a Tagalog movie freak - and it's such a delight for me to watch entries for the MMFF every December! From paying Php5.00/movie, I am now paying Php160.00/movie! Ouchie!! 5) I forget days and dates! Like when I had a meeting, the date was supposed to be 12/15 - I remembered only on 12/22! The bad thing was - I thought 12/22 was 12/15!!! 6) I never got to feel the cold weather!! Was it just me or it didn't get chilly? - My Panget proposing: Honest to goodness, I was clueless. It came as a shock to me and to most everyone actually. - Trips: There were countless trips! First was Sagada (drove 12 freaking hours! ), Second was Corregidor (won this! ), Third was Guam (Mabuhay Miles was offering 50% off on miles! ), Fourth was Hong Kong (won this! ), Fifth was Bangkok (Uber cheap fare from Cebu Pacific!) and the last trip for the year was in Cebu for my friend's wedding! - Superb travelling companions: I have to say - if it wasn't for the company - my trips this year would have flopped big time!! I've had the BEST travelling companions! Lucky, lucky me!! My Corregidor Trip was so wonderful! My Hong Kong trip was one for the books!! I will never ever forget you guys! Thanks for the wonderful company and the memories!! 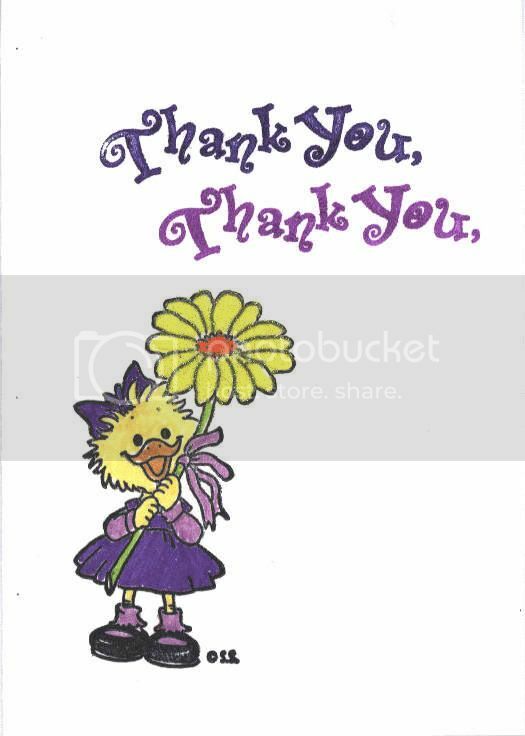 :) Thanks Carlos, Mickey & Wife, Anton & Family, Jen & Stan, Jesus & Company, Reena & Dan, Sandro & Sheng and Lucci. - I found Faith: It made my 2008 more peaceful. He indeed works in mysterious ways! It was by that faith that I was able to abstain from eating pork and beef for the whole year. Yes, no cheating!! - Learning to pay it forward: I was so inspired by the Dialogues at Starbucks talk of JP. Thanks Fran and Z for inviting me!! :) Mwah!! Happy 2009 guys! :) Wish you all the best! !